Cystic fibrosis (CF) is a genetic disorder that compromises the ability of the mucociliary transit (MCT) system to clear debris and pathogens from the airways. To directly assess airway health and the effects of treatments we have developed a synchrotron X-ray microscopy method that non-invasively measures the local rate and patterns of MCT behaviour. The aim of this experiment was to determine if our non-invasive local airway health assessment method could identify changes in nasal MCT rate following clinical treatments known to alter MCT. Experiments were performed on the BL20XU beamline at the SPring-8 Synchrotron in Japan. Mice were anaesthetized, a small quantity of lead sulphide particles were delivered to the nose, and images of the nasal airways were acquired. The nasal airways were treated with hypertonic saline or mannitol to increase surface hydration and change MCT. Custom software was used to locate and track the motion of the lead particles throughout the image sequences, and to calculate individual and bulk MCT rates. MCT rates increased following both treatments, but due to high variability there were no statistically significant differences in MCT rate between treatments. However, in future studies we hope that the improved sensitivity provided by this technique will allow us to identify useful CF lung disease-modifying therapies. 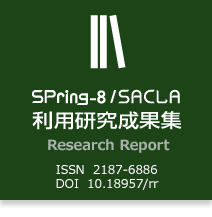 Simultaneous measurement of SAXS, WAXD and FTIR spectra has been performed to clarify the hierarchical evolution in the melt-isothermal crystallization of polyoxymethylene. The derived structural change process was found to be almost common to the various kinds of polymers, suggesting a universality of the proposed crystallization mechanism. aInstitute for Materials Chemistry and Engineering, Kyushu Univ, bGraduate School of Engineering, Kyushu Univ. Hard X-ray Photoemission Spectroscopy was employed to investigate the elemental composition and chemical state of core-shell bimetallic nanoparticles deposited on a solid substrate. A shift in Au 4f7/2 and Ag 3d5/2 binding energies together with the change in surface elemental composition of the nanoparticles suggests that a low-temperature alloying occurs for bimetallic nanoparticles. aToyota Central R&D Labs., Inc., bToyota Motor Corp.
aInstitute for Chemical Research, Kyoto University, bFaculty of Education, Shiga University, cResearch Institute for Sustainable Humanosphere, Kyoto University, dKureha Trading, Co., Ltd. Structural Analysis of Titanium Ion in Sulfuric Acid Solutions by XAFS.